I didn’t know until a few days ago that many phones and tablets support USB mice, trackballs, and other devices through USB On-The-Go (OTG). After reading about it and that most Samsung devices support it, I got a pack of two Ugreen OTG micro-USB to USB Female adapters in the mail this week – US$7 – and was pleased to see it works on my 1920×1200 Galaxy Tab A 10.1″ tablet. 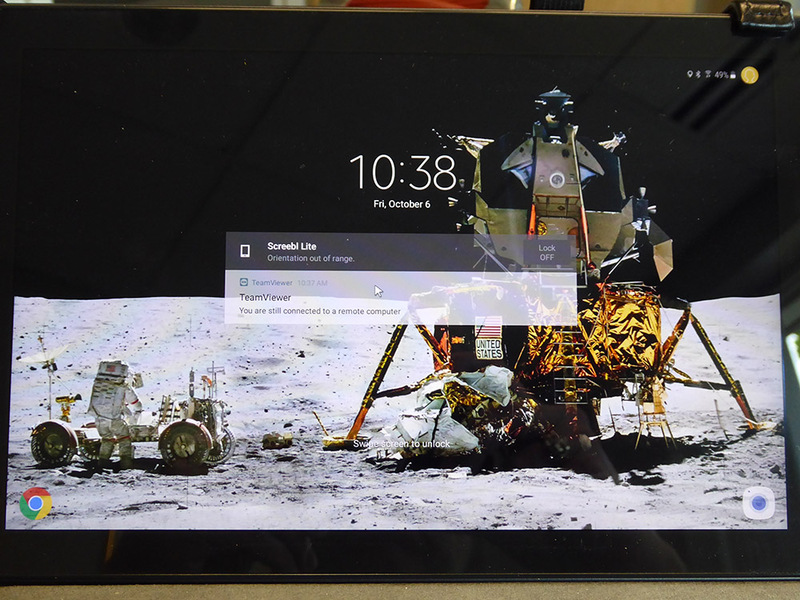 It’s a little strange the first time you see a traditional cursor on your tablet – see the middle of its lock screen in the photo below. I found that you can even control its speed under Language and Input settings on Android, so it’s now exactly the same speed as my desktop cursor. Buttons on my trackball duplicate the Android home and back functions, click-drag is the same as swiping, and the scroll wheel works perfectly. A slight touch of the trackball wakes up the tablet. With a trackball and a Bluetooth keyboard, there’s no need to touch the screen at all. Working with a remote 1920×1080 Windows 10 desktop becomes much easier and faster. 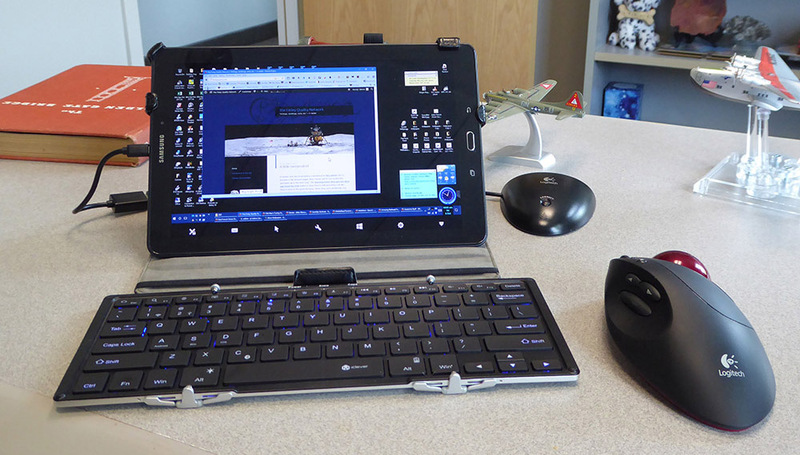 With a folding LED-backlit Bluetooth keyboard that has Android and Windows function keys, my favourite trackball connected through OTG, TeamViewer connected to my home or office desktop as in the photo below, a multi-angle folio cover, and a good pair of reading glasses, I’m not sure I have any need for a laptop. The only real difference is the screen size. That trackball and its USB-connected receiver is Logitech’s Cordless Optical Trackman, long ago discontinued, with remaining new examples being sold for US$400-500 these days (when they were still being made, I believe their list price was $69). Why so exorbitant? Because it remains the best trackball anyone has ever made. I have two – bought at the much lower price, of course – that I’ve been using for many years at home and in the office, and this is one of three hot spares I still have that I bought for forty or fifty bucks apiece when they were still being made several years ago.